There is a crisis in the Church today. The Body of Christ lacks shepherds who are willing to serve the Good Shepherd by loving His sheep. The Lord is looking for leaders who will stand up and answer His call to shepherd His flock. Very few leaders in the Church are willing to give up their own visions and hopes, in order to lay down their lives for those they lead, but Jesus is looking for shepherds who will give up everything to follow His perfect example. 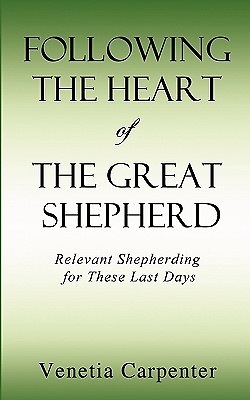 In this book, Following the Heart of the Great Shepherd, gain the tools you need to not only lead others in love and truth, but to allow Jesus Christ to lead your heart into deeper intimacy. Amidst the busyness of life and the stresses of the day, learn how to connect with the Spirit and grow in relationship with the personhood of God. "In her book, Following the Heart Of The Great Shepherd, Venetia seeks to exhort and challenge each church or ministry leader to make growing closer in relationship with Christ the main priority of church leadership." Mike Bickle, Director, International House of Prayer, Kansas City MO. VENETIA CARPENTER is an ordained minister as well as the founder and President of Ecclesia International Ministries. She works in a leadership administrative role for Christian Media Ministry, GOD TV, where she functions as the Call Center Manager and is also on staff at the International House of Prayer in Kansas City. Venetia's first book, Church, who's your Daddy? has impacted people and ministries around the world to draw closer to Christ.